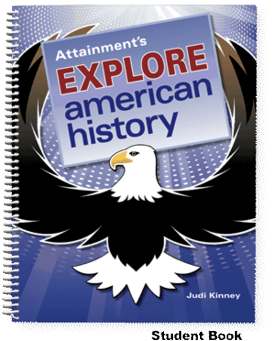 Explore American History is a full-year curriculum for high school students participating in alternate assessments based on alternate achievement standards. It has four components: Student Book, Tools of History Mats, Teacher’s Manual, and DVD. The Student Book has 9 chronological chapters from Early Years to A New Century. These follow a consistent format: Anticipatory Set, Vocabulary, History Stories, and Quiz. The simplified text is heavily illustrated and is intended to be read to the student, so there’s no minimum reading level required. The curriculum emphasizes the use of important social study tools. Students study biographies and analyze videos to give perspective to the historical content. The Teacher’s Manual has a lesson outline for each page of the Student Book with Big Ideas, Additional Facts, and Extension Activities. The DVD contains 7 historical video clips that link to chapters in the Student Book. The Student Book has nine chronological chapters from Early Years to A New Century. These follow a consistent format: Anticipatory Set, Vocabulary, History Stories, and two Quizzes. Twenty-five one-page biographies with corresponding comprehension exercises are also aligned to the curriculum’s chronology. Simplified text is heavily illustrated and is intended to be read to the student, so there’s no minimum reading level required. The curriculum emphasizes the use of important social study tools, like timelines, graphs, and maps. A consumable Student Workbook is included so students can have their own book for the Anticipatory Set, Vocabulary, and Quizzes. The Teacher’s Manual has a lesson outline for each page of the Student Book with Big Ideas, Additional Facts, and Extension Activities. It also includes a PDF of the Student Book on disc with a Classroom License for printouts. Includes four, two-sided Tools of History Mats, each 14” x 20”. They include two History of America timelines, Continents and Countries teaching maps, and African American and Native American photo collages. The Historical Video Clips DVD has actual network news coverage of the 9/11 disaster, news footage of Henry Ford with Thomas Edison, and five other clips of historical value. Curriculum Includes: One Student Book, one consumable Student Workbook, a Teacher’s Manual with PDF disc, Historical Video Clips DVD, and 4 Tools of History Mats.